I was invited to a press event about two weeks ago at Balnea. Located about 1h15 away from Montreal, the location is perfect to get rid of any stress. What makes it special compared to other spas is the beautiful land they own, which includes trails for hiking or running and also a beautiful lake for swimming and paddle boarding. Another reason why I favour this spa is the fine dining experience their restaurant offers, and there's high chances you'll want to get a bite if you're going to drive all the way there. 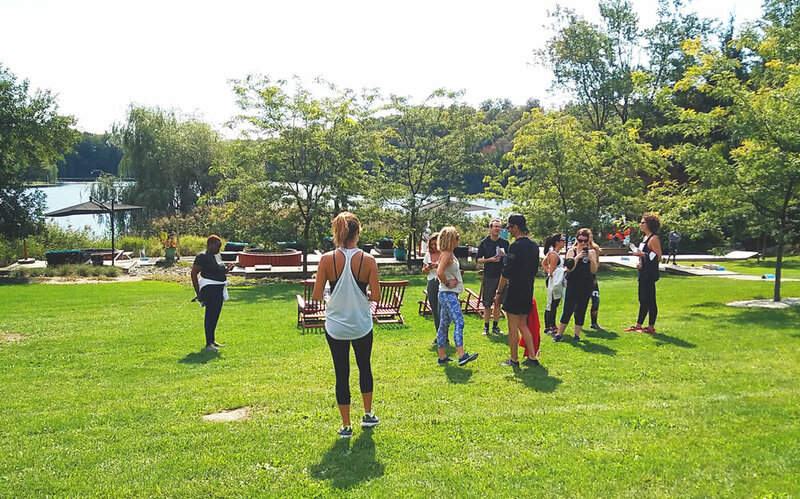 After making all the bloggers go through an outdoor workout, a new activity offered for the next few weeks, we had the chance to try the new fall menu. On to the game changing moment! So after a delicious and light lunch, we were introduced to the brand new Guided Meditation and Sensory Path. To do so, we were invited to put on a wireless & waterproof headset. A very calm voice took over the next 45 minutes guiding us to different areas of the spa, constantly going from hot to cold installations and rest stops in between. It made me appreciate every little detail of the circuit and reach a new level of meditation. The voice pushed me to try installations of the spa I had never stepped foot in before but also encouraged me to stay longer in ones I already knew. The last stop of the circuit was back into the lounge area where a lovely setup was waiting for me. This whole experience really gave me the chance to "turn my brain off" for 45 minutes. It was so lovely that as I'm writing about it, I cannot wait to go back! Right now, you can try the guided circuit for an additional $10. However, it's only offered in French since it's so new and took a lot of work. I wouldn't be surprised to see additional circuits and languages come up in the near future.